We got our Christmas tree this past weekend. 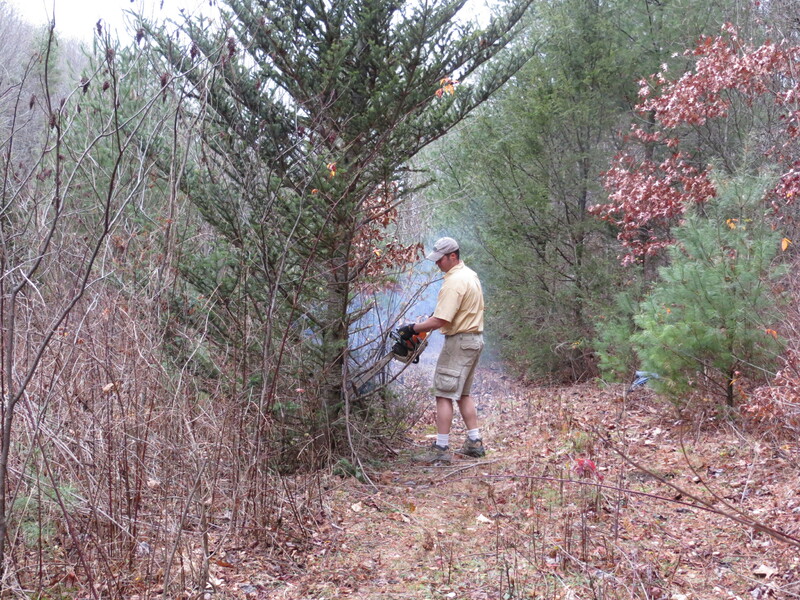 We drove to some family property where years ago, some in the family planted Frasier firs to be cut for Christmas trees. This property is fairly remote, higher altitude than where we live, and really beautiful. The headwaters of a river run through it, gracing it with 3 awe-inspiring waterfalls, and long stretches of peaceful pools and rapids. We all love to come out to this property, William especially–it is a relaxing place. We usually only come here to vacation, which is really glorified camping in a very rustic old house. This weekend, however, we came for a very quick trip. Our goal was to cut a couple of trees to decorate our house and a cousin’s house for Christmas. Usually, we can drive over dirt trails and get fairly close to the tree “lot” even in a non-4WD vehicle. 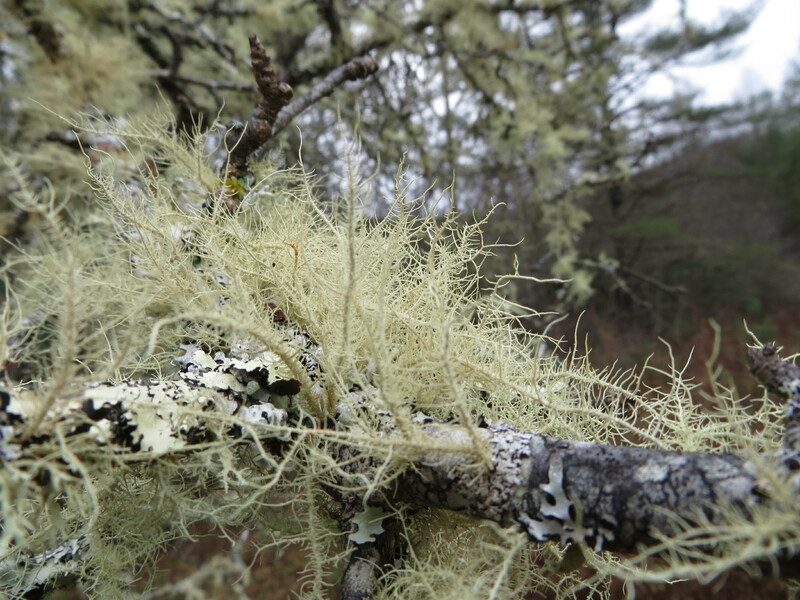 But, it has been raining quite a bit lately and the trails were a bit overgrown. We needed to walk back to the firs. 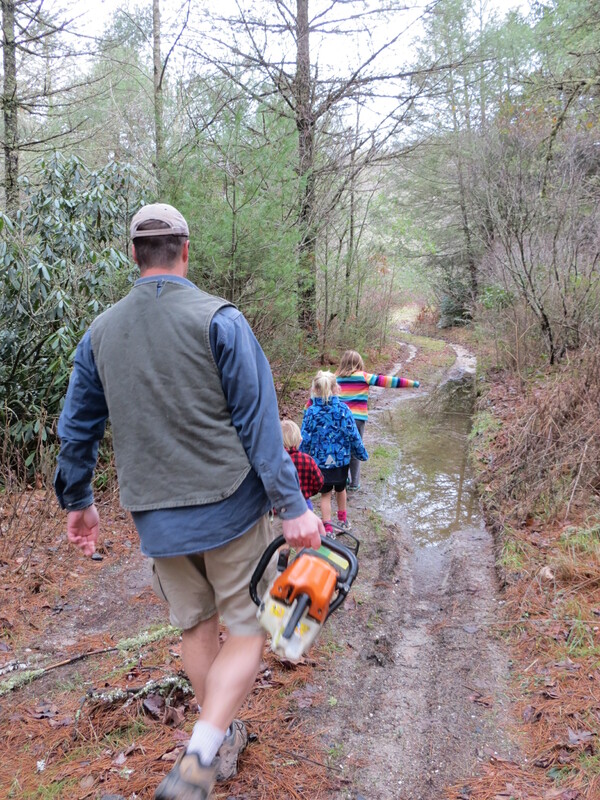 It is a pretty walk without much incline and not very far, but we had to consider our options when we realized we had to get 4 children and one heavy chainsaw to the lot and 4 children, one heavy chainsaw, and 2 trees back to the car. The walking children started complaining pretty quickly about have to “walk so far”. 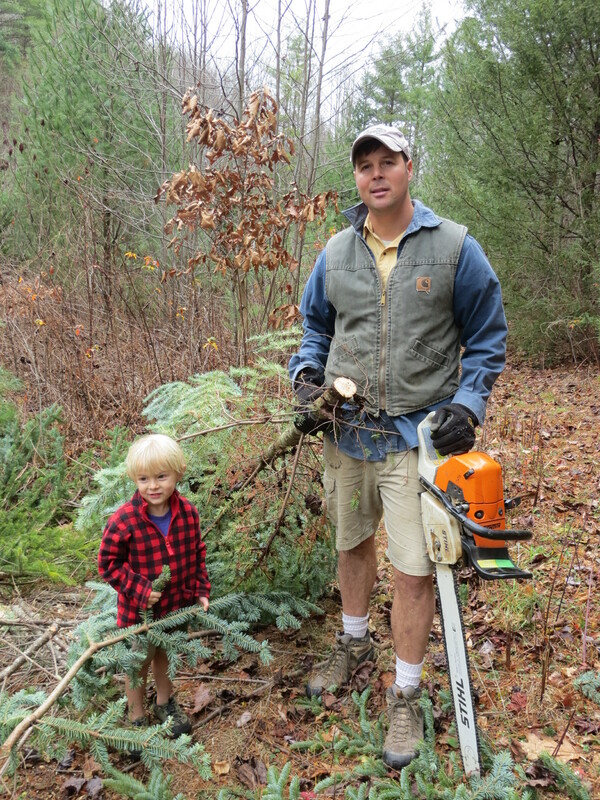 William thought maybe we should cut some white pines since they were so close to the car and we were not really sure how many Frasier firs were left or what condition they were in. But, we went on–if only to get a little woodland hiking in that day and get children outside (in spite of complaints)–to check out the firs. 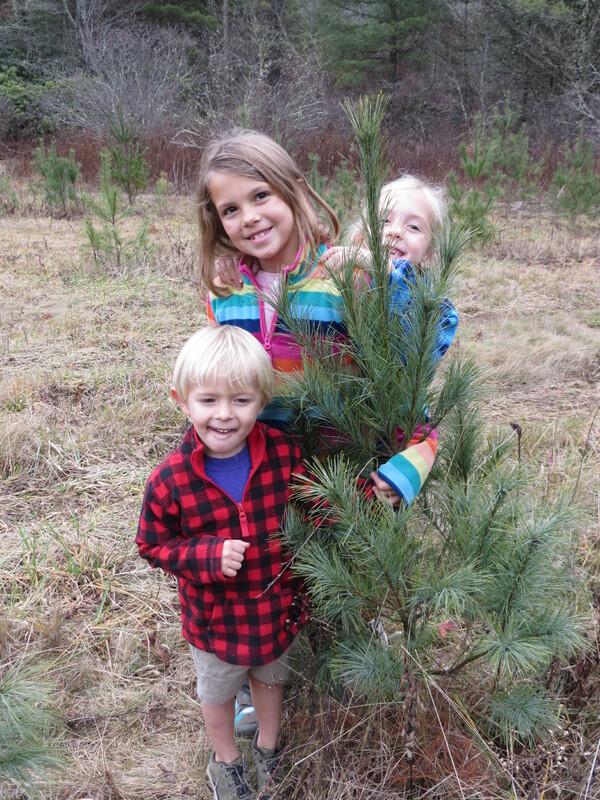 As soon as we got to the fir lot, complaining stopped and everyone enjoyed looking for the right trees. We quickly found one that was right by the trail. 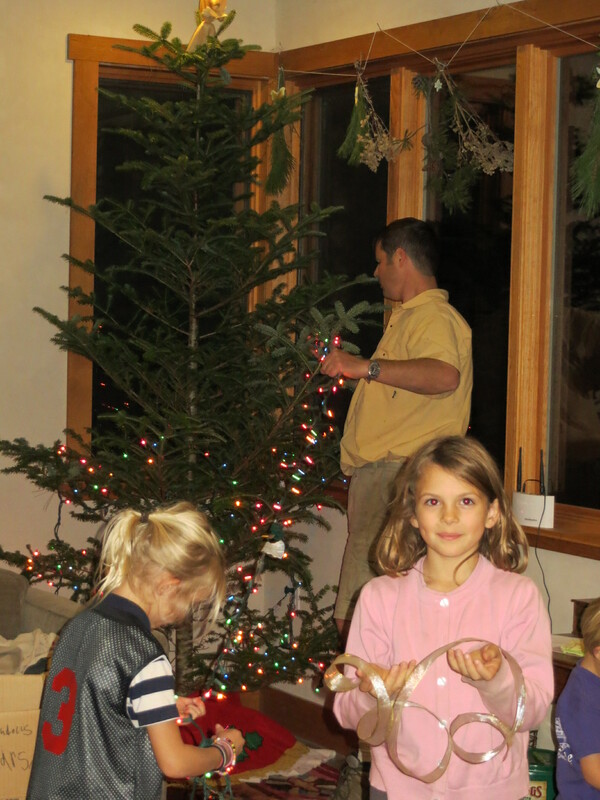 It was very tall, but since the lot is old, we often have to cut down a fir and cut the top out for a Christmas tree. This one was also damaged on the bottom from bushhogs or other traffic that had nicked it and damaged the lower branches over the years. William cut it down, cut it up, and cut off the top. I realized then that if he cut another one of that size, it was going to be very difficult to get back to the car with two trees. 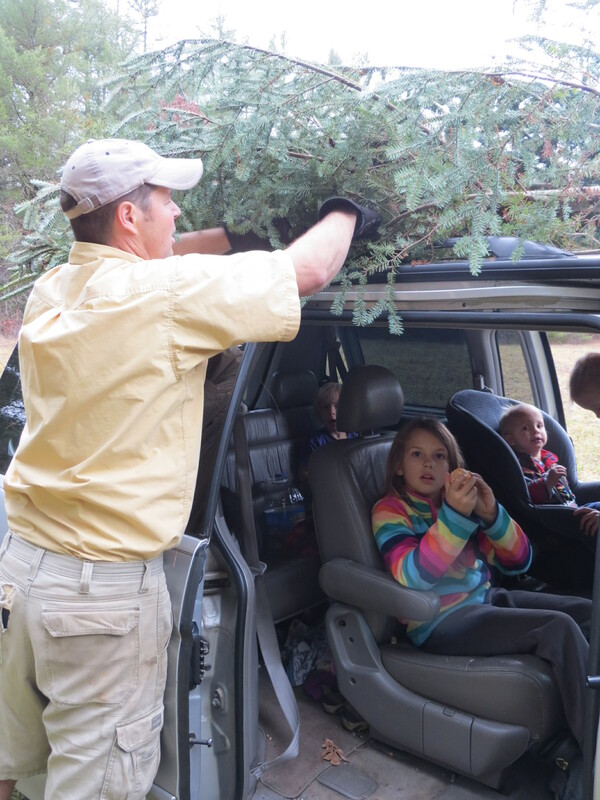 That tree was heavy–the trunk, even at the top, was larger than your normal Christmas tree trunk. So, I picked out the next tree. A scraggly, thin, 9 foot tall fir, bunched up next to some sapling poplars and right beside the trail. It was not healthy. It was yellower than the first tree and had dead needles in the center. Most of the dead poplar leaves were decomposing in the branches. But, it would not weigh much, it was the perfect height, was thin and tall, and I figured it would look fine when decorated. The children liked it, too. 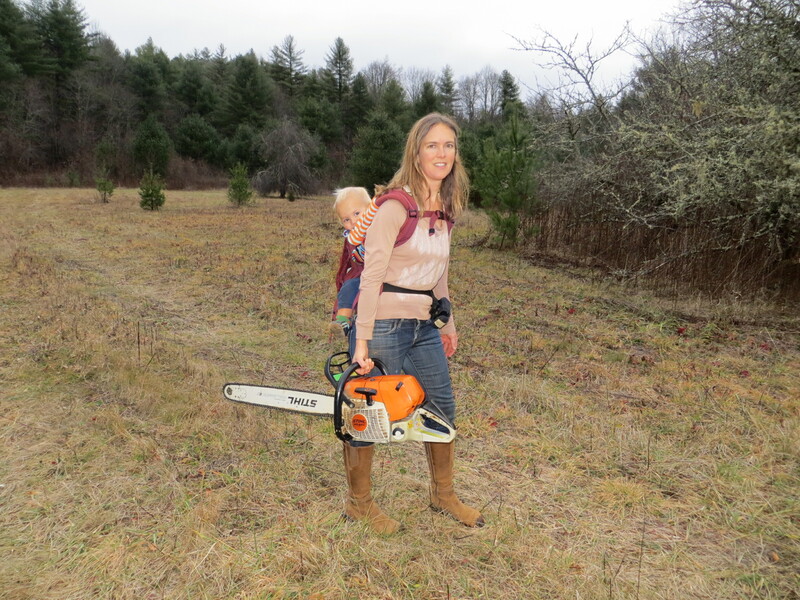 We got the two trees (I carried the chainsaw since William had the firs), headed back to the car and headed home. Naps in the car on the way home helped everyone enjoy decorating the tree that evening. Isn’t it beautiful? The children certainly think so. I think we got the perfect one. 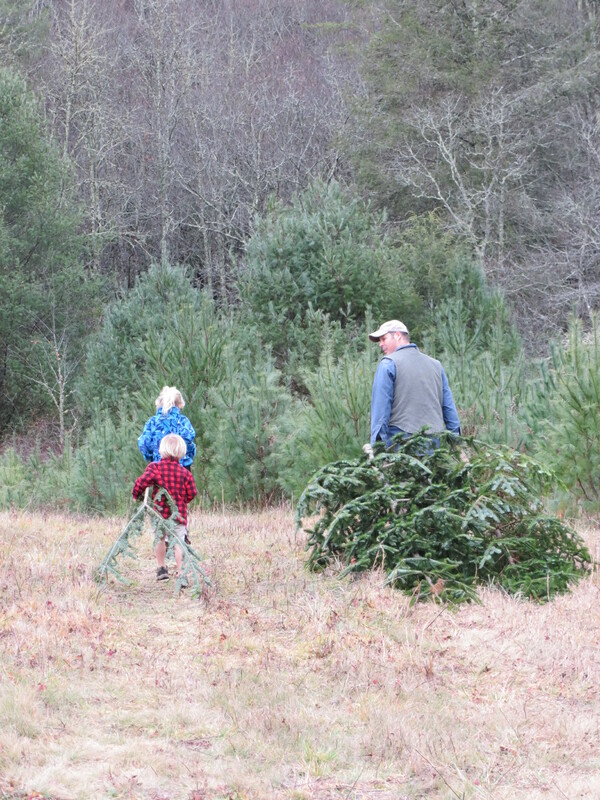 My family did not cut trees from the woods to use as Christmas trees, though I remember for a few years, my brother and I would cut down some small pine trees, put them in our room and decorate them. They took up all the spare space in our bedrooms. One day, I would like to have a red cedar as a Christmas tree–a wild and native one. 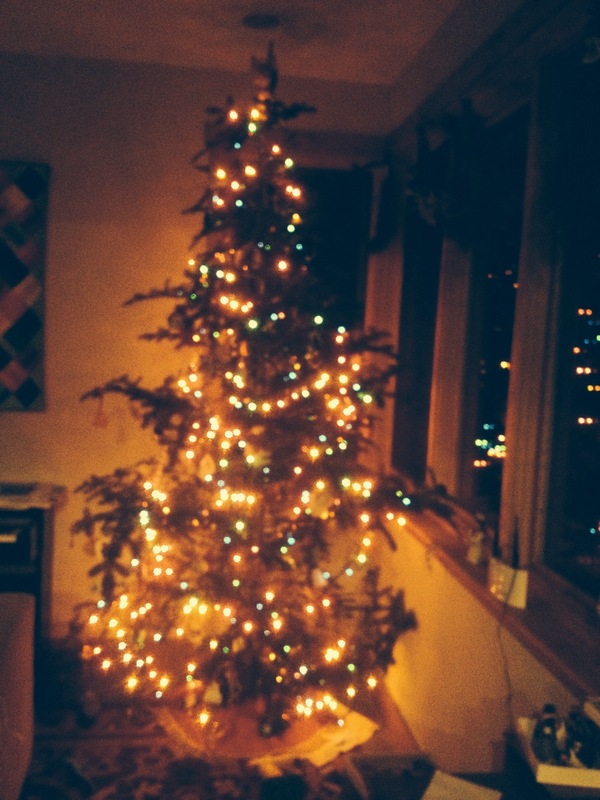 What did my great-grandparents do for a Christmas tree? I never thought to ask.